Roger Penrose writes in the Guardian, providing a scientifically precise summary of Hawking's accomplishments as a physicist (worth reading in full at the link). Penrose and Hawking collaborated to produce important singularity theorems in general relativity in the late 1960s. Here is a nice BBC feature: A Brief History of Stephen Hawking. 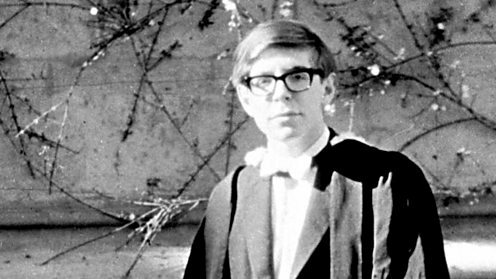 The photo above was taken at Hawking's Oxford graduation in 1962. ... This radiation coming from black holes that Hawking predicted is now, very appropriately, referred to as Hawking radiation. For any black hole that is expected to arise in normal astrophysical processes, however, the Hawking radiation would be exceedingly tiny, and certainly unobservable directly by any techniques known today. But he argued that very tiny black holes could have been produced in the big bang itself, and the Hawking radiation from such holes would build up into a final explosion that might be observed. There appears to be no evidence for such explosions, showing that the big bang was not so accommodating as Hawking wished, and this was a great disappointment to him. These achievements were certainly important on the theoretical side. They established the theory of black-hole thermodynamics: by combining the procedures of quantum (field) theory with those of general relativity, Hawking established that it is necessary also to bring in a third subject, thermodynamics. They are generally regarded as Hawking’s greatest contributions. That they have deep implications for future theories of fundamental physics is undeniable, but the detailed nature of these implications is still a matter of much heated debate. ... He also provided reasons for suspecting that the very rules of quantum mechanics might need modification, a viewpoint that he seemed originally to favour. But later (unfortunately, in my own opinion) he came to a different view, and at the Dublin international conference on gravity in July 2004, he publicly announced a change of mind (thereby conceding a bet with the Caltech physicist John Preskill) concerning his originally predicted “information loss” inside black holes. Notwithstanding Hawking's premature 2004 capitulation to Preskill, information loss in black hole evaporation remains an open question in fundamental physics, nearly a half century after Hawking first recognized the problem in 1975. I read this paper as a graduate student, but with little understanding. I am embarrassed to say that I did not know a single person (student or faculty member) at Berkeley at the time (late 1980s) who was familiar with Hawking's arguments and who appreciated the deep implications of the results. This was true of most of theoretical physics -- despite the fact that even Hawking's popular book A Brief History of Time (1988) gives a simple version of the paradox. The importance of Hawking's observation only became clear to the broader community somewhat later, perhaps largely due to people like John Preskill and Lenny Susskind. I have only two minor recollections to share about Hawking. The first, from my undergraduate days, is really more about Gell-Mann: Gell-Mann, Feynman, Hawking. The second is from a small meeting on the black hole information problem, at Institut Henri Poincare in Paris in 2008. (My slides.) At the conference dinner I helped to carry Hawking and his motorized chair -- very heavy! -- into a fancy Paris restaurant (which are not, by and large, handicapped accessible). Over dinner I met Hawking's engineer -- the man who maintained the chair and its computer voice / controller system. He traveled everywhere with Hawking's entourage and had many interesting stories to tell. For example, Hawking's computer system was quite antiquated but he refused to upgrade to something more advanced because he had grown used to it. The entourage required to keep Hawking going was rather large (nurses, engineer, driver, spouse), expensive, and, as you can imagine, had its own internal dramas. Better to be Lucky than Good?